CUHK long Hengbu horse business city located in Guangzhou City, the traditional cloth clothing distribution center - Haizhu District, Guangzhou, Zhongshan University is in the fabric from the fabric market Haiyin confluence, material recovery Nanbu and Tianxiong textile market and the city of Phoenix and other major the formation of the domestic textile market with the most dynamic areas of large traders in the center of the cloth. 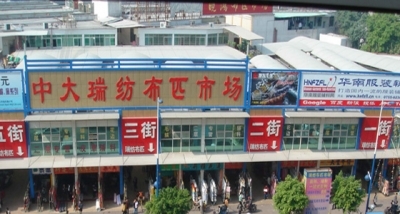 Mall is located in Xingang West Road, to the rich contemporary design, the layout of open science, advanced facilities, the Guangdong city of Zhongshan University cloth cloth largest textile distribution center in the traditional interpretation of a new era charm, Guangzhou cloth trade market rising jewel. Long Hengbu horses and key business city street, north Newport Road, west Dongxiao Road, Xichang Kong closely follows the Newport overpass, east Yile Nan Road were side by side in shopping malls and Pokka. Mall through a number of city main road intersection, a total of 30 bus pass, Metro Line Zhongshan Station Jinju 200 meters, transportation connections, Lulu smooth, Guangdong region's largest distribution center for one of the traditional cloth. Long Hengbu horses to large scale commercial city, a scientific layout, complete facilities, convenient transportation network and systems management model advanced for the heavyweights to create a one-stop purchasing platform. September 29, 2003 has been officially opened, welcome guests from nine major advantages over large-scale: across the two main roads, on an unprecedented scale, fabric accessories business district, A zone between the existing shops in more than 600, B District, the three phases completed the first phase of introduction of two stand-alone shops, is now fully entered. Second, the three shops has started investment. Prime location: located in the hub of traditional fabrics, sinks off all directions, the main facade of more than 600 meters long, busy, dizzy it is the first transportation experts: Trade City is located in Haizhu District, a number of main road junctions, the main route leading to the Sun Yat-sen, there are three way more than a dozen bus from Zhongshan Station of Metro Line 200 meters Lulu smooth. Booming wealth: MTR, traffic arteries, in endless streams, surrounding hotels, banks, commercial city and other municipal facilities improved, four-passenger sinks, extra cash. Reasonable layout: professional function zoning, open design, flexible combination, spacious pavement, extending in all directions. Fully furnished: with a large parking lot, warehouse, passenger transport market and professional network. Easy Real Estate: Provides payment discount in three phases, six months to one year rent-free to help you easily start, ride operators often fashionable: based on the domestic, relying on Hong Kong and Macao, Southeast Asia, sections of the popular, traditional clothing materials Yiwang Da Jing variety, ample supply: well-known manufacturers have been stationed throughout the country; all kinds of clothing fabric, accessories everything. For you to create a one-stop purchasing platform.